Blaze Defense Systems offers a variety of fire suppression products and deployment systems for various applications. The majority of our gear is designed and developed for first responders in mind. Tested, tried and true, our gear has been put through the test on a variety of levels. The products developed and delivered by Blaze Defense Systems offers a great product at a great price. 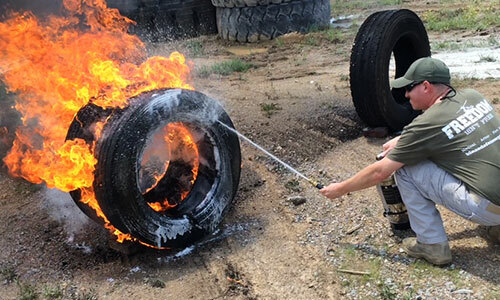 Knowing that the products developed through Blaze Defense Systems gives further confidence to the end user, makes us strive to make our products even better, through research and development. From compact, pocket size deployable fire suppression tools, hand held refillable units, backpack worn units, even larger skid and wheeled units, we have something for everyone. Please let us know how we can assist your team. BDS Fire Suppression Agent being deployed from the adjustable nozzle going from stream to mist. Agent being deployed from a 6 liter (1.5 gal) refillable deployment device. Fire suppressed within seconds. 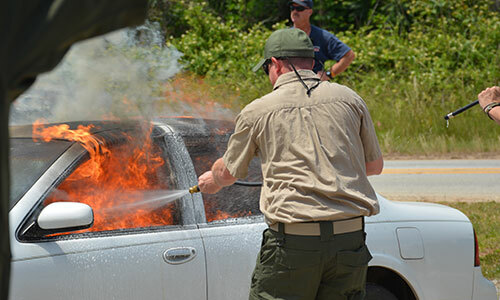 Car fire suppressed within less than a minute and surfaces were cool to the touch as well.